Forced to pull the recently retired, 34-year-old Jay Cutler out of the booth and back under center in wake of Ryan Tannehill’s season-ending injury, the Miami Dolphins fell short of expectations in 2017, leading to a 6-10 record and the No. 11 pick in the 2018 NFL Draft. However, a rebound year may be in order, as Dolphins general manager Chris Grier seemingly made the best of his high draft capital. Grier filled a key need without sacrificing value with his first selection of the draft, adding highly regarded Alabama defensive back Minkah Fitzpatrick with the No. 11 overall pick. 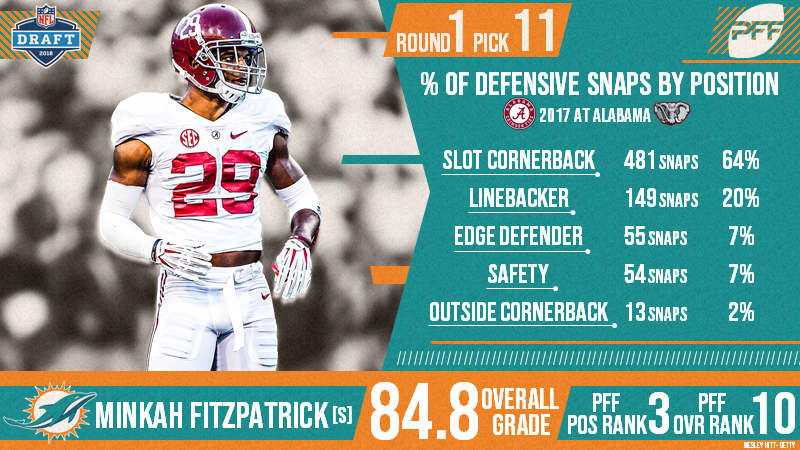 Slotted as the 10th-ranked player on our big board, Fitzpatrick adds high-end ability and versatility to a Dolphins secondary in need of a healthy dose of both traits. He earned 81.1-plus overall grades in each of his three years in Tuscaloosa, a testament to his consistency and durability. Despite playing just 13 defensive snaps along the boundary this past season, Fitzpatrick can make an immediate impact as either an outside or slot cornerback in Miami’s secondary. Outside of three-year veteran Bobby McCain, no qualifying Dolphins cornerback earned an overall grade above 56.0 in 2017. Continuing to add value on Day 2, Grier selected former Penn State tight end Mike Gesicki and Ohio State linebacker Jerome Baker, the former of which a likely Week 1 starter. The 6-foot-6, 247-pound Gesicki blew the doors off the 2018 NFL Scouting Combine, running a 4.54-second 40-yard dash, benching 225 pounds 22 times and recording a 129-inch broad jump. Using his size and athleticism to his advantage, Gesicki proved to be a mismatch nightmare with the Nittany Lions, as he earned 85.3-plus receiving grades in each of his final two collegiate seasons. Former Arizona State running back Kalen Ballage and Ohio linebacker Quentin Poling stand out as two potential marquee picks on Day 3 of the draft, as both prospects have starter potential down the road. At 6-foot-2, 228 pounds, Ballage is a high-cut back with all of the tools necessary to be a complete back in this league. He flashed elite traits as a runner, receiver and returner in bursts all throughout his career, but he was limited in ASU’s offense and rarely given the opportunity to develop in any one area of the game. If Miami’s coaching staff can crack the code with Ballage, he’ll prove to be quite the Swiss army knife at their disposal. Poling is the epitome of consistency, as he earned 83.0-plus overall grades in all four years of his collegiate career. He’ll surprise offenses with his speed and athleticism in coverage, and his run-defense is equally as good if not better. He, of course, will experience growing pains transitioning from the MAC to the NFL, but if he can sew up the holes in his game and find a home on special teams early in his career, he could earn a starting nod at off-ball linebacker in the future.